The announcement that Pulse Oximetry Newborn Screening is coming to Ontario is amazing news for early detection of babies born with Critical Congenital Heart Defects (CCHD). This program will help catch upwards of 150 babies a year born with Congenital Heart Disease (CHD) but who currently leave the hospital undiagnosed. 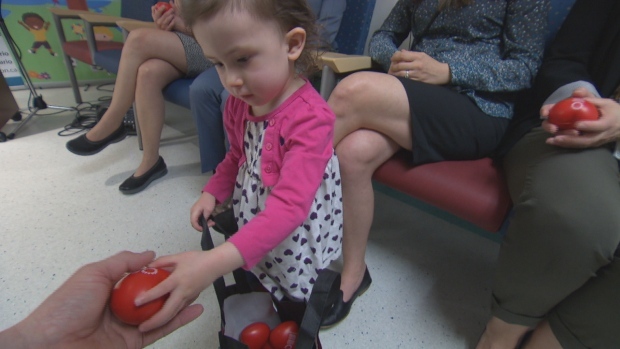 “Early detection and treatment of CHD is critical in ensuring the best possible long-term quality of life for individuals that will live with this life-long disease" stated Krista Vriend, President of the Canadian Congenital Heart Alliance (CCHA). "Leadership and progress on programs like this one in Ontario and a similar one being rolled out in British Columbia give us hope and momentum to see similar screening programs implemented across Canada.” she added. The Canadian Congenital Heart Alliance (CCHA) is the only national organization supporting both children and adults living with CHD and has been a strong advocate on behalf of patients and new born screening programs. Some babies affected with Congenital Heart Disease can look and act healthy at first, but within hours or days after birth they can have serious complications. Pulse oximetry newborn screening is a non-invasive test that measures how much oxygen is in the blood and can help identify babies that may be affected before they leave the newborn nursery. If detected early, infants affected with CHD can often be treated and lead longer, healthier lives. Congenital heart disease (CHD) is the most common congenital disorder in newborns affecting approximately 1 in 100 babies. Critical CHD, defined as requiring surgery or catheter-based intervention in the first year of life occurs in approximately 25 percent of those with CHD. Although many newborns with critical CHD are symptomatic and identified soon after birth, others are not diagnosed until after discharge after birth. Infants with critical cardiac lesions face the risk of increased morbidity and mortality when there is a delay in diagnosis and timely referral to a tertiary center with expertise in treating these patients.